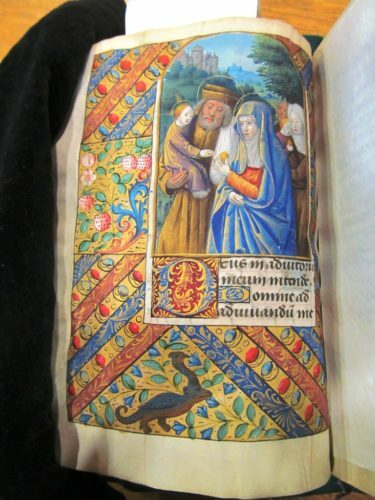 While looking through the Newberry Library’s extraordinary collection of medieval books of hours, I was surprised to see how frequently strawberries dotted the marginal illuminations. The berries usually appear alongside colorful flowers; while obviously decorative, I began to wonder why this food was so prolific in imagery, yet relatively more obscure in contemporary recipes. 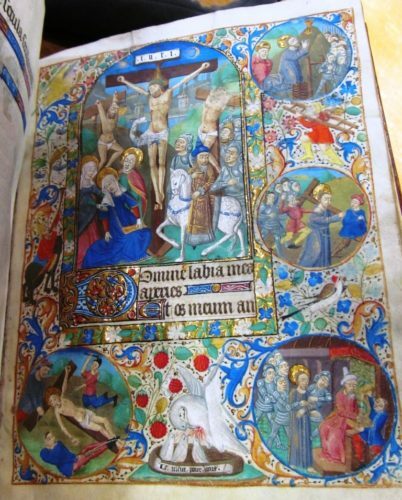 Books of hours are books for Christians that provide prayers and devotions, particularly the Hours of the Virgin. The Hours of the Virgin are an abbreviated form of the Liturgy of the Hours, also dedicated to the Virgin Mary. In the fourteenth and fifteenth centuries, these books were enormously popular. Scribes created copies for readers of varying socioeconomic levels, and the most expensive books of hours were lavishly illuminated. Containing colorful images and frequent goldleaf, these manuscripts allow us to see the beautiful, opulent life of the wealthiest nobles and royals in the late Middle Ages. The images can be a feast of information for scholars, incorporating medieval clothing, table settings, and room décor with familiar Biblical imagery. 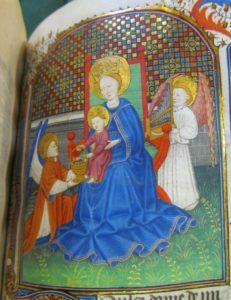 Although I set out trying to locate images of food and dining in books of hours, strawberries kept attracting my attention. Whether French or Flemish, fourteenth- or fifteenth-century, and moderately or lavishly decorated, it seemed as though strawberries were everywhere. Strawberries were undoubtedly consumed in medieval Europe. Fruit sellers sold the berries on the street, having advertised them with musical cries. The Parisian street cries for fresh strawberries lived on in an anonymous thirteenth-century (c. 1280) French motet; you can listen for “frese nouvele” sung in conjunction with other sounds of Parisian life. Strawberries appear in household records of the aristocracy and royalty. England’s King Henry VII not only received these fruits as gifts in 1506, but his gardener at Greenwich cultivated them. Entries in the records of Anne Stafford, dowager Duchess of Buckingham, reveal her purchase of the berries throughout the summer of 1465. The fruit also occasionally appears in contemporary menus; the French Livre fort excellent de Cuysine (1555) lists strawberries in a course served alongside items like almonds, a Flemish cake, and white jelly. “Strawberye.—Take Strawberys, & waysshe hem in tyme of ȝere in gode red wyne ; þan strayne þorwe a cloþe, & do hem in a potte with gode Almaunde mylke, a-lay it with Amyndoun oþer with þe flower of Rys, & make it chargeaunt and lat it boyle, and do þer-in Roysons of coraunce, Safroun, Pepir, Sugre grete plente, pouder Gyngere, Canel, Galyngale ; poynte it with Vynegre, &a lytil whyte grece put þer-to ; colure it with Alkenade, & droppe it a-bowte, plante it with þe graynys of Pome-garnad, & serue it forth. Still other recipes, such as one for darioles, a type of custard-filled pie or tart, invite the cook to include strawberries alongside dates and other spices, only “if it be in time of yere.” While strawberries were obviously a known, accessible, and popular summer berry, they appeared relatively infrequently in contemporary recipes. The Christ Child holds a basket filled with strawberries. Why, then, do these berries appear so frequently in the religious imagery of books of hours given their proportionately few occurrences in recipes? I conjecture two main reasons. First, the number of recipes including strawberries is likely quite low because the fruit was probably most often served fresh and whole, rather than in prepared dishes, as mentioned above in the course of a French meal. After all, how many strawberries do you manage to carry into your kitchen after a harvest in your strawberry patch or a U-Pick farm? Freshly picked strawberries are quite easy to consume in embarrassingly large quantities, no cooking required! Second, strawberries were rife with symbolism in medieval Christian iconography. Depending upon the context, as well as the viewer/reader’s subjectivity, the red berries could represent drops Christ’s blood, while its trifoliate leaves were suggestive of the Holy Trinity. Or when paired with flowers, as strawberries typically are in horae marginalia, they represented righteousness. The fruit was also associated with the Virgin Mary. I have selected a variety of personal images from my research in the Newberry Library’s books of hours, each illustrating at least one of these interpretations of strawberry iconography. Strawberries were likely depicted in these devotional margins because they were so popular. The little fruit did not require the preparations which burdened other victuals. 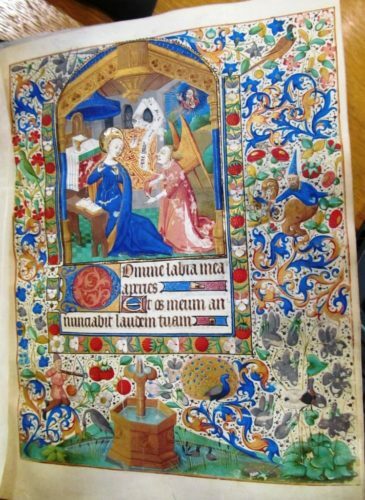 A noble reader, especially, would instantly recognize the berry not only as a delicious fruit so easily eaten out-of-hand, but also one symbolizing Christ’s suffering, the Holy Trinity, and the dedicatee of Books of Hours, the Virgin Mary. What a great amount of work for such a tiny fruit. Christopher Woolgar, The Culture of Food in England 1200–1500 (Yale University Press, 2016), 109. Ken Albala, and Timothy Tomasik, eds., The Most Excellent Book of Cookery: An Edition and Translation of the Sixteenth-Century Livre fort excellent de Cuysine (Prospect Books, 2014), 241. Constance Hieatt, and Sharon Butler, eds., Curye on Inglysch: English Culinary Manuscripts of the Fourteenth Century (Including the Forme of Cury) (Early English Text Society, 1985), 46. Thomas Austin, ed., Two Fifteenth-Century Cookery-Books (Early English Text Society, 1888), 29. Celia Fisher, Flowers in Medieval Manuscripts (Toronto: University of Toronto Press, 2004), 24; and Celia Fisher, “Flowers and Plants, the Living Iconography,” in The Routledge Companion to Medieval Iconography, ed. Colum Hourihane (Routledge, 2016), 460–1. Melitta Weiss Adamson, Food in Medieval Times (Greenwood, 2004), 22.